"Just got off the Ougie with some ghosts who say Mayday McCain might be behind these Boeing crashes lately. Very disturbing!" he shared. "...Might sound far fetched, but consistent with Mayday's track record with planes. Worth looking into?" the President added seconds later. 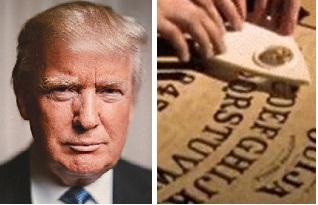 Trump, who said his aim for his recent Oval Office seances was to obtain a thank you from McCain for his honorable treatment of him after his death, indicated that he has been in communication with several "highly intelligent dead people". "Haven't been able to get John on the line, but have been talking a lot with a ghost named George who was apparently a member of the Thomas administration," Trump tweeted. "Very smart guy, this George. Says John McCain is extremely annoying. And bald." Trump went on to disclose other details of his paranormal contacts. "Naturally I asked George who the best President ever was since he's been around so long and is so wise, and he said it was myself, Donald Trump. Hands down, better than Washington, Douglas, or even Lincoln. No suprise there! " he wrote.